Enjoy a spectacular, 180-degree view of the Gulf of Mexico and the world-famous Siesta Key white sand Crescent Beach. Watch the sailboats glide across the Gulf, while dolphins play in the water just off the beach. This is the view from every room plus the lanai in this fifth floor, center front condo. Start your day with an early morning stroll along the water's edge and perhaps some shelling. Follow this with a day of swimming in the crystal clear, aqua blue water of the Gulf, or enjoying a round of golf at one of the many nearby courses. End your day in this tropical paradise by watching the magnificent colors in the sky as the sun slowly sets on the horizon, turning the view to a crimson orange. Our condo is beautifully appointed and immaculately clean. The living room has a queen-size sleeper sofa, a love seat, and two additional chairs. The unit has separate private bedroom suites, each with their own bath, cable TV, ceiling fan, and Gulf view with sliding glass doors to the lanai. The master bedroom has a queen size bed and leather recliner. The guest room has two twin beds. The unit also features a brand new all-white kitchen with granite counters, fully-equipped and modern. All with an unobstructed view of the Gulf. Unobstructed Gulf front views from every room. Cook dinner, eat in the DR, lie in bed, or just sit in the LR and gaze at the water or sunset. Panoramic Gulf Front views from every room. Lie in bed and enjoy the boats bobbing on the water. The lanai offers comfortable furniture for sunset viewing. Spectacular! 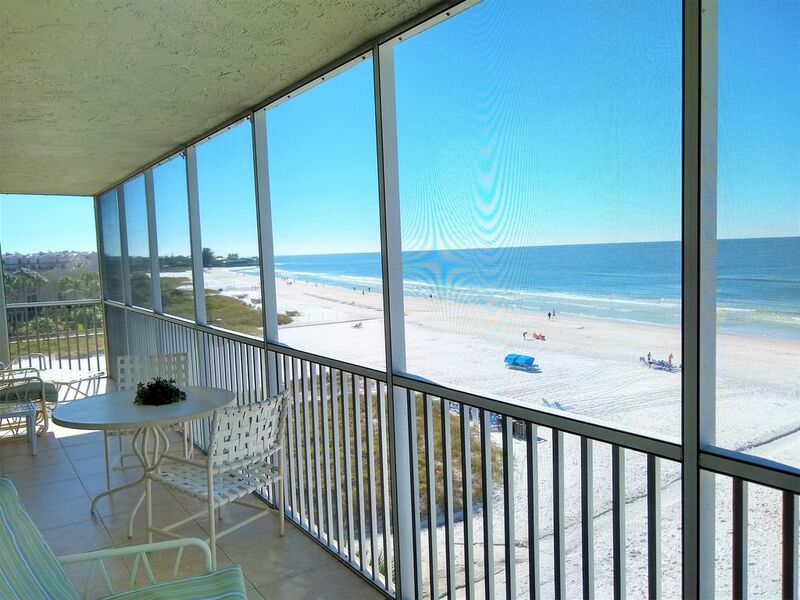 Beautiful condo with a fantastic view of Siesta Key Beach and the Gulf! We rented both 501S and 201S for a family vacation. We’ve vacationed in Siesta Key for the last 8 years and Crescent Arms is by far the nicest accommodations we’ve experienced! Great location! Great View! And very clean! We've stayed in a Crescent Arms Gulf front condo a few years ago so we knew what to expect...and we were not disappointed. The Nulty's were great hosts, from the initial booking through the time we checked out. Just about everything we needed was provided; we knew - and expected - that we would have to buy more TP, drinking water, and paper towel so we stopped at Publix before checking in. Good thing because the tap water is nasty. If I could request one little "extra", it would be small bars of soap for the kitchen and bathroom sinks. The condo is very nice and comfortable and it didn't take us long to feel at home. However, I want to mention a few things that might benefit future guests, assuming the owners are not aware: I found myself wondering what time it was - even on vacation - but there was no clock in the main living area. The one in the kitchen must have had a dead battery. A night light in the guest bathroom would be nice. Actually, there is one in the drawer but no bulb. And lastly, the guest-room beds are a bit uncomfortable - low spots in the center. If I was a child, I would have no problem sleeping, but my slightly aged hips were uncomfortable. Overall, our stay was awesome ! I definitely recommend this condo but selfishly don't want anyone to know of it. Thank you, Mr and Mrs. Nulty, for sharing your piece of paradise. It was an amazing time! I couldn’t have asked for a nicer condo! The owners are wonderful!! Thank you, Katie, for the wonderful review. You are terrific and we can't wait to have you back next year! Clean and very comfortable- View amazing!!! We had a very relaxing time in Siesta Key. Despite the cooler weather there is plenty to do and wonderful eating establishments. The million dollar view from the deck/porch everyday was wonderful!!! Highly recommend and will definitely be back soon! Thank you, Casey and Diana. You were wonderful guests and you took excellent care of our Home At the Beach! We would love to have you back again. We were impressed, not just with the unbelievable view, but with the wonderful owners' care for our comfort! We definitely would return. It was our first VRBO experience; we feel very fortunate. Thank you for the wonderful review. You were fantastic guests. We feel really blessed that you selected our condo for your winter visit.